This whole adventure started because I wanted a stamp with my new logo, but while looking for custom handmade stamps and comparing prices I came to the conclusion that I could just make one. And it would be a lot more fun. I found this basic tutorial and sought out my supplies. 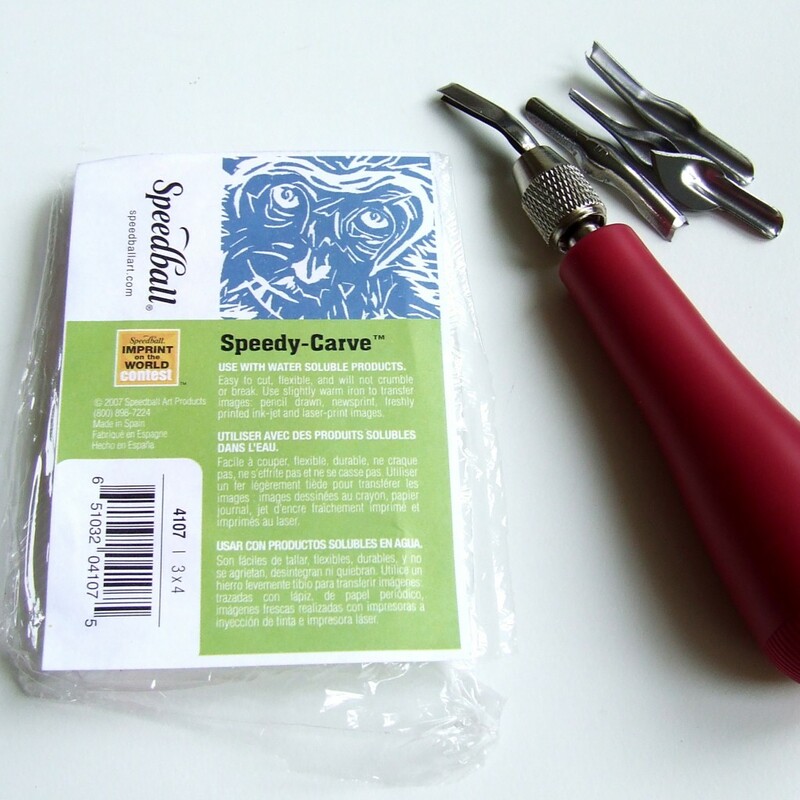 I purchased my rubber material, called Speedy-Carve, and my lino cutting tool from Dharma Trading Co. I got the smallest size to start with which was a 3″x 4″ block for $2.99. And the shipping charges were also very reasonable. If you follow me on Twitter you already know that my first attempt at the logo came out… backwards. But, my second attempt was much better and I’ve now made 5 stamps in total. I managed to salvage the first bad logo stamp by carving into the reverse side to make that simple leaf outline stamp above. For anything very specific it’s best to go by image transfer, but I enjoyed just freehanding a design onto the rubber and going from there much more. I didn’t have any scrap wood laying around so I used some thick cardboard for the backing. It’s not very pretty, but it works grand for me. 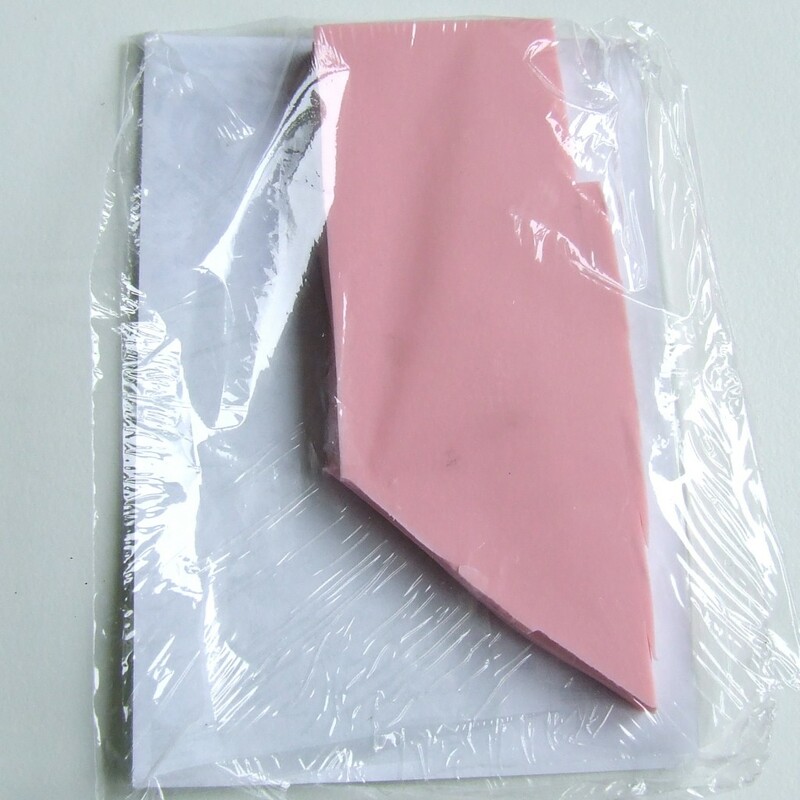 I still have quite a bit of rubber left from that small block I purchased, so depending on the size of your stamps, you can get quite a lot from one little block. You can also carve into rubber erasers which is equally fun. I had a lot of fun making these! If you haven’t tried stamp carving yet, I highly recommend it. It’s my new favourite hobby. After jewelry making, of course. thanks hon! the first one was pretty messy looking, you just have to be very patient and careful with letters I found. 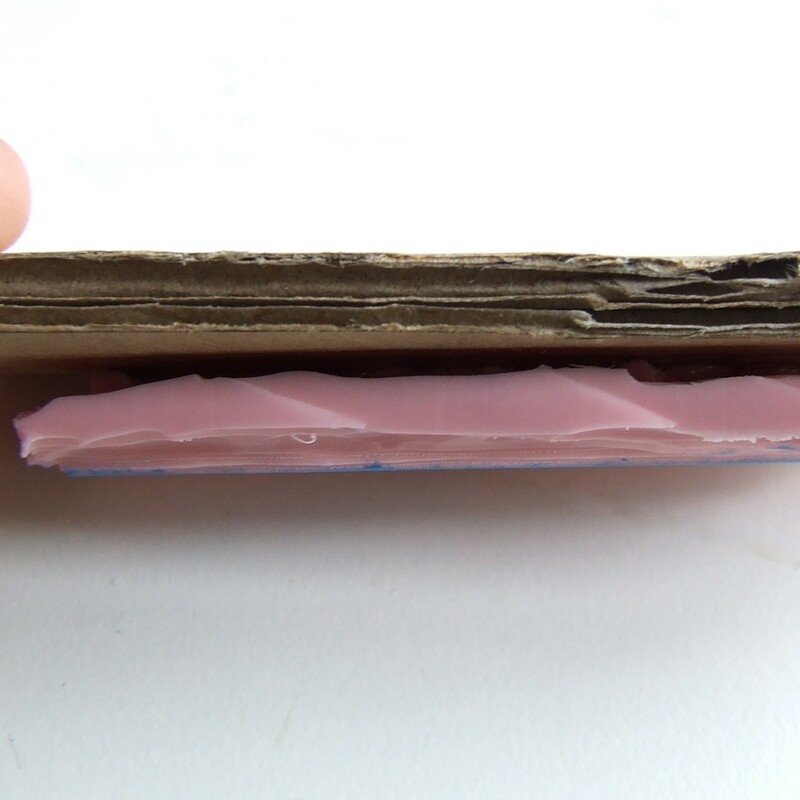 I have a couple of blocks of that…I am so impressed with your results! I’m going to have to give that a try. 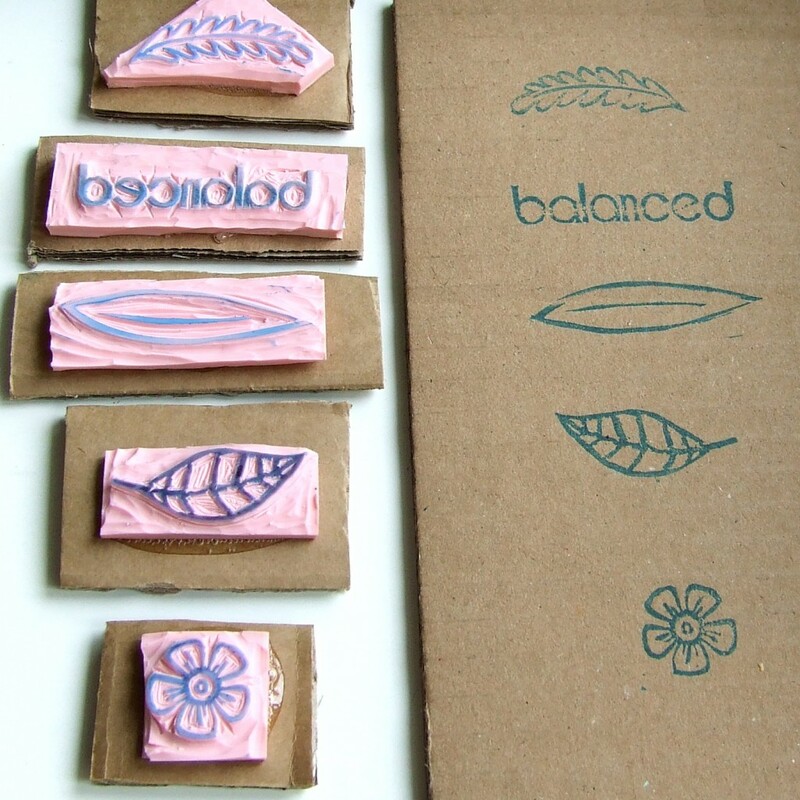 Your ‘balanced’ stamp is amazing! I’d love to see yours too! Okay, that’s awesome! I’ve done stamp carving before for printmaking and let’s just say it’s not a skill I do well, lol. But I love your results! Wow well done I’m so impressed, I did printmaking in college and even I would be scared to carve out those letters, you did a really great job!! This is brilliant Rachel and the results are amazing, well done you! It’s exactly the inspiration that I needed. I’ve also been looking at customised stamps but was toying with the idea of creating one myself even though I haven’t done any kind of printing since college. Going to order all the bits you have suggested…. Thank you, Paula! :) It’s so much fun!